The Grifter gang love their pilsners. Not many breweries would think to put a watermelon pilsner in their core range, but Grifter won people over with it (not that they had much convincing to do) and the Grifter Pilsner at the brewery is a hit with Inner West locals. So perhaps it shouldn’t be a surprise that, when the 2019 hop harvest came around, while many people were scrambling to get their hands on wet hops to brew big stanky IPAs, head brewer Glenn decided he was going to throw his stash into a pilsner. 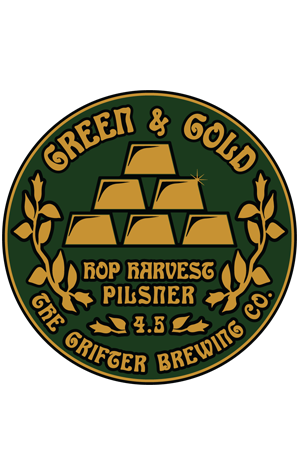 While it comes in at a reasonable 4.5 percent ABV, Green & Gold does away with many of the subtleties you might expect from a pilsner. It’s a bigger, beefier, maltier creature than most, and it isn’t shy in introducing you to the abundance of hops used within. As well as wet-hopping this pils in the whirlpool with Enigma, the brewers did a heavy dry-hop with an experimental New Zealand variety to push the beer even further. There’s a grassy, earthy depth that belies its alcohol content, and a resinous bitterness that blankets the tongue. Think lush Tasmania or New Zealand on a drizzly day, with rolling hills and wet earth and tree sap all loosing their scent into the thick air, and you’ll have an idea.